All in a Basket - Offering Gift Baskets for Birthday, Get Well, Thank You, Sympathy, Anniversary, New Baby, Care Packages and many other occasions. 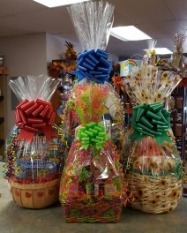 All in a Basket is a family owned gift basket business, located at 519 Main Street, Forest City Pa 18421. For over 13 years, we have been offering gift baskets for all occasions. Our website offers a wide range of baskets for your convenience however, if you don't see exactly what you would like call us. We love to create custom baskets. All in a Basket offers gourmet baskets for all occasions such as Birthday, Get Well, Sympathy, Thinking of You, Thank You, Anniversary, and more. You can choose from coffee and tea baskets, bagel and fruit baskets, bath and body, chocolate baskets, candle baskets, pasta baskets, diabetic baskets, bridal shower centerpieces and much more. If there is an occasion that requires a gift, you will find something unique at All in a Basket. We offer daily delivery and shipping.